« LUX Film Days @ Budapest – 2018. Rock – Punk lovers … Peter Hook arriving to Budapest with his Substance disks. 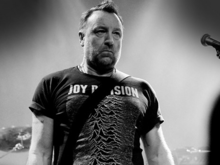 The founder of Joy Division, Peter Hook & The Light is on European tour with the Substance. Among the tour Budapest will not be left out. The audience to come along will hear the songs of the legendary Substance on Tuesday – November, 13. 2018. at 7.45 p.m. in the DÜRER Garden – Budapest. Peter Hook’s Band last visited us in 2015, then played the „Unknown Pleasures”. The Joy Division album and within their repertoire the „New Order songs” were also included. The band is noted for performing the Joy Division and New Order albums live and the audience visiting their last concert surely enjoyed the band’s live performance. The versatile Hook in 2007 left the New Order and Peter Hook & Light with his band became one of the most authentic keeper of Joy Division’s oeuvre. Step-by-step in addition to legendary songs swam beautifully pieces of New Order album, consisting of Substance, singles and other songs from the collections. England’s most influential artists: Joy Division and shortly became known as a founding member, but the cult band, broke up after the suicide of vocalist Ilan Curtis, the surviving members soon formed the New Order and continued on. Alongside become the co-owner of the Hacienda and also has written several books.